Today I would love to focus on an ingredient that I eat on an almost daily basis. Collard Greens. What came to your mind first? The south perhaps, slow cooked collard greens with a ham hock. All that salty bacon flavor seeping into the greens? Well, there are literally a gazillion (yes, gazillion) other ways to use collard greens and in a much healthier fashion! Let’s begin by looking at why in heavens I choose to consume this as one of my favorite greens. For one, collards are a great plant source for calcium. They are also, like other cruciferous vegetables, anti-inflammatory, have cancer preventative properties, are high in antioxidants and to boot they taste delicious! I also want to make sure you know how to prepare them. The stem itself is great for juicing, not so much for eating. So you’ll want to tear that out or cut it out prior cooking. To tear, fold the leaf in half around the stem (like a taco) and with one hand pulling just the stem and the other hand stripping off the leaves drag the leaves off the stem and voila! You are left with the leaves in one hand and a naked stem in the other (ok, well about 90% of the time. The other 10% sometimes those leaves just don’t want to let go!). Now we’ve got some leaves, what to do with them? · Recipe: Red Pepper and Garlic Greens. Cut the leaves into strips. Saute some slices of garlic in a good swig of olive oil over medium heat. Remove the garlic with a slotted spoon. 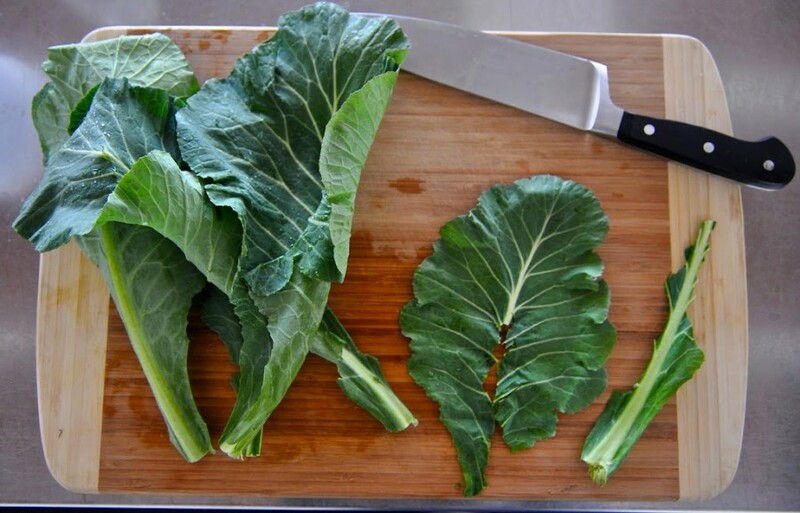 Add the sliced collard greens to the pan and toss until they are wilted and bright green. Add a nice pinch of red pepper flakes, add back the garlic slices, saute another 30 seconds to 1 minute. Season with salt and enjoy! · Recipe: Green Onion Sauteed Baby Potatoes and Greens . Add a good glug of olive oil or coconut oil to a nonstick pan. Lightly crush potatoes and place in the pan. Saute until lightly browned. Add ¼ c. chopped green onions, some minced garlic and a bunch of collards that have been cleaned and sliced. Saute until fragrant and the collards are wilted. Season with salt (or queso fresco!!) and a squeeze of lemon or lime. · Easy Idea: Add them to soup! Just slice thinly and add to the soup about 20 minutes before it is finished cooking. · Easy Idea: Add them to a morning shake! · Or, why not…Make my recipe for Egg and Collard Green Tacos! Those are some of my ideas, I hope you share with me some of yours!